Who to believe? BART management or the unions? Both sides are pointing fingers that the other is spreading falsehood. And the media is eating this game of 'he said, she said' up and presenting only the worst case scenarios to the public. Even those within the unions are now saying different things. One says mediators will help the negotiations, the other says mediators will only slow the process and get us farther from achieving a compromise. And who defines what is "unnecessary"? I don't remember passengers ever having the opportunity to fill out a ballot ranking what we find is necessary with BART extension plans?!? If BART workers do strike, I am definitely going to ask my employer to allow me to telecommute. It will be more productive for me to do work in the 1.5 hours that I'd otherwise be stuck in bay bridge traffic. BART takes its passengers for granted. We pay a handsome fee for a daily roundtrip ride to and from work. The sad truth is, we have little commute alternatives here. BART can continue to raise fares and we'd probably still have to fork out the extra mount. What else can I take? Transbay bus? I guess I could look into that as well. Carpool? I'd still be stuck on the bridge after passing the toll. BART workers and management both claim they care about the passengers and do not want this disagreement to lead to strike. Do you believe that? Maybe they care a little but selfish interests come first of course. As my tweet indicated, I don't know what compels people to go shirtless and shoeless on BART just because the weather is hot. I really don't enjoy seeing people's sweaty bodies up close and could also really do without being forced to catch glances of people's feet. OK, it wasn't that many people going around without shoes and shirts but I did encounter at least 4 patrons like that today and 2 of them look like they were homeless. You see that in Hawaii in casual eateries and the local Walmart but that's just the vibe and culture. On a BART train in the SF Bay Area during commute hours...not OK. I'd like to express my sincerest sympathy to the family and friends of the 9 passengers who lost their lives during Metro crash in DC. What a frightening and horrible experience for all involved. I hope that finding the cause of this crash will bring a little bit of peace and resolve to the families and all passengers affected. I have a friend who takes the Metro daily. I haven't heard from him yet after sending an initial email right after news of the crash broke. I really hope he's OK. 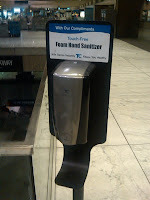 Finally...hand sanitizer by the escalators!! About time! I want to see them by the train doors too! THANK YOU, BART! Fare hike and maybe a BART strike on July 1st? According to SF Chronicle, BART Management and Union leaders are in negotiations to determine a compromise. Rachel Gorodn reports, "Management hopes to slice $100 million from the deficit by cutting labor costs. The proposed savings would come by diminishing health care and pension benefits and changing work rules that would give management more say over employee assignments - measures BART officials say are necessitated by the economic conditions." A pact must be reached by July 1st. A strike, actually, will work against BART and the workers' favor. Why? A strike and sudden termination in service will only force employers to increasingly embrace telecommuting. And after realizing that productivity doesn't decline with telecommuting, guess what? BART will only lose passengers..permanently. I'm not saying all employers will allow telecommuting all of a sudden, but even if 10% of them do, that is significant revenue loss for BART. Also on July 1st, our fares will go up by 6.1%. Watch your ticket value! Not to mention, train service will decrease starting September. The real losers in all this drama-- passengers who rely on BART to get to work and make a living. These two topics have always been hot buttons on this blog. Would love to hear your thoughts! I love Concord trains. As much as I can love a BART ride home after a long exhausting day at work, I am always happy to see a Concord train over a Pittsburg/BayPoint train. Why? Because only about 50% of the passengers lining up for the P/BP train get on. Many choose to not get on even though they can just transfer. As a result, I get a 2-seater to myself usually, and really relish the space and privacy. Why does BART still have Concord trains? There must be some logic behind it that I'm hoping to learn from one of you. I'm glad-- I like them. While others groan that it's just a Concord train, I'm always pleased to hop right on there with plenty of room to spare. This is the 500th post of BARTMusings. Thanks for hearing me complain, question, praise and discuss through 500 experiences. The Chronicle reports today that the 4-month-old baby boy who died after being left alone for hours in a car at the El Cerrito Plaza BART station was identified today as Everett Carey. This whole situation was completely tragic, heartbreaking and shockingly irresponsible. I don't care how busy you are, how stressed you are with work, or how much of a rush you are in....I cannot comprehend how someone can forget to drop of a kid at daycare and just leave him inside a parked car for hours. I really cannot even imagine how someone can forget a child in the car, in ANY situation. To me, it is appalling. And yes, I will judge in this situation. This is so sad and I hope that little Everett is somewhere up there, peacefully enjoying the life he should have had. I'm a big fan of taking BART to SFO. There really is no better way to get to SFO from the East Bay. But, I've sensed that many people are more reluctant to take BART to OAK. I feel the same way for various reasons. For one, the Coliseum stop is not the safest station. And AirBART shuttle is not as continuous as it should be. Waiting for it both ways just make passengers less willing to use BART as an option to OAK. Then, there's the transfer requirement for those of us on the Pittsburg/Baypoint line. That makes me question whether I'd be saving any time at all by riding BART? I might as well just drive, and I do. The biggest deterrents for me are MacArthur transfer and the occasional long gaps between AirBART shuttles. What's your take on BARTing to OAK? How much do "performers" make a day in the BART stations? We always see performers in the downtown BART stations but the other day, seeing a quintet really made me wonder...do they make that much that all five of them prefer to be there over doing something else with their time? I guess if they were all unemployed, making $20 between all 5 of them is better than $0. I just can't imagine making much more than $20 each day. I do love the music-- it picks me up in the morning when my brain isn't exactly ready to begin the day. Do you guys give money to performers? When I used to exit at Embarcadero, I would give $1 every Friday to this old Asian man who played a traditional instrument. I can't say I liked, or knew how to enjoy, the sound of it but he seemed so dedicated to this instrument that I was compelled to at least give him $1 a week. I'm sure most of you would agree that people tend to keep themselves on BART and those who reach out to strangers to strike up a conversation are perceived as weird or annoying 95% of the time. People who are not reading a magazine, listening to music, or engrossed in their device, generally just keep their head down or their eyes closed. To demonstrate this anti-social nature on BART, 2 friends were standing within 4 feet from each other today, looking opposite ways. It wasn't until Embarcadero, where one was getting ready to leave and finally looked up, the two realized that they were standing next to each other the whole time. They hugged briefly and chatted for 10 seconds before one had to exit. Interesting the extent to which people keep to themselves on BART. It's so true. I usually am glued to my iPhone or a magazine (when there's no connection). I would not know who is sitting behind or across from me!